Get a handle on introducing out-of-town guests to your wedding locale with simple-to-assemble hanging welcome packets. Inside each, include a note of greeting, along with such items as an itinerary of events, a detailed map, and a list of places to visit. Then ask the hotel concierge to hang them from room doors so that when guests check in, they can check out all the local attractions. Calligraphy by Maybelle Imasa-Stukuls. Print the word welcome (or have your calligrapher script it) twice across the top of a legal-size sheet of card stock. With a ruler and craft knife, cut the card stock in half lengthwise; punch a hole in the bottom of each piece with a 2 1/2-inch circle punch. With a bone folder, crease each card-stock strip 4 inches from the top, and fold to form a pocket. Fasten sides with round label stickers. 24.Nat King Cole- L-O-V-E or the Joss Stone Version. 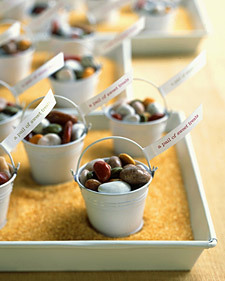 They may look like the real thing, but candy pebbles in small galvanized pails are a sweet and delightful favor for an outdoor wedding; a note lets guests know they’re for eating. The candy shown here is marzipan and chocolate-covered dried fruit in disguise. Print your message onto paper, cut into strips, wrap around the pails’ handles, and secure with double-sided tape. Set the pails in trays filled with turbinado sugar. Create a romantic ambiance by paying great attention to your lighting. 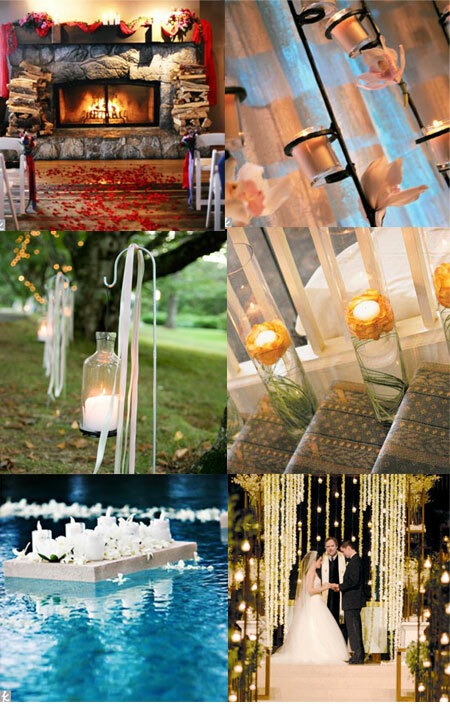 Candles and twinkle lights can make any venue feel warm and romantic.